Polly Moyer gives a detailed patient perspective on what it is like to live with a rare neurological condition with an array of sensory symptoms. Polly Moyer – was born and brought up in Yorkshire, and now lives in Bristol where she campaigns for people with rare conditions and ‘writes for rare’ including http://www.bmj.com/content/353/bmj.i2042 . She is cofounder of Action for MdDS UK – Technology Training Treatment and is also a trained Laughter Yoga facilitator. 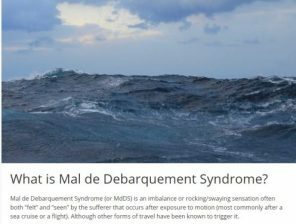 In 2006, after a motion trigger, I was diagnosed – remarkably quickly – with Mal de Debarquement Syndrome (MdDS) which is a rare neurological condition that results in a sensation of rocking/bobbing and/or swaying. This is often described as ‘the feeling of being on a boat, when you’re not’. In this instance I was triggered by a train trip, having previously been triggered by a long-haul plus short hop flight in 2003. The first episode was severe but short, but the one after the train trip lasted for 8 months. An interesting feature of MdDS is that most patients feel better when re-exposed to passive motion, which distinguishes it from PPPD (Persistent postural-perceptual dizziness). Like some forms of ataxia and multiple sclerosis, MdDS can be episodic, which can make it an emotional rollercoaster. Like migraine, MdDS affects more women than men, which can make it harder for men to get diagnosed. Since unwittingly joining the world of sensory-processing imbalance, I’ve witnessed the diagnostic odysseys others have gone through and hope my observations will help primary care doctors who are faced with patients whose balance autopilot isn’t working. My favourite meme from the world of ‘living rare’ is that what is learnt from studying rare conditions brings added knowledge to more common conditions. So that’s why I’m here and grateful for this opportunity to follow the Zebra tradition of paying it forwards (people with rare conditions are sometimes referred to as ‘Zebra’ patients and are often proactive when it comes to trying to educate health care professionals). ‘Dizzy’ patients can be notoriously hard to diagnose, to the point where we’re sometimes thought of as ‘heart-sink’ patients in primary care. Patients pick up on this so my first observation is to try to avoid letting us feel like ‘problem patients’. My second is that anyone whose balance has gone wonky may also be suffering from brain-fog: our systems are working so hard to stay upright that there’s little processing power left for anything else. Brainfog is common for people with conditions that have an impact on their vestibular systems – read more here. So being patient (hah! ), acknowledging brain-fog and asking good questions about the symptoms can make a world of difference. Unfortunately many doctors are not trained sufficiently regarding conditions that feature non-rotational vertigo, so they may hear that their patient is off balance and assume they have a peripheral condition such as Ménière’s Disease, BPPV, Labyrinthitis etc and treat or refer accordingly. It’s not surprising to me that these are common misdiagnoses for people with MdDS and Vestibular Migraine. It’s also not surprising that trending diagnoses, such as PPPD, can lead to PoTs and dysautonomia getting overlooked. Another hurdle is that patients have to get past being labelled as having ‘medically unexplained symptoms’ and/or ‘functional’ symptoms, which isn’t easy. Even if they do they then often face being told that their symptoms are the result of anxiety or depression, rather than the cause. As such I found number 17 in this series of videos https://p-cns.org.uk/wp-content/uploads/2018/10/adultwith-dizzy-spells-edu-videos.pdf particularly helpful and am grateful to a fellow member of the Rare Revolutionary Magazine Community for telling me about it. One word of caution, however – a woman with motion triggered MdDS was referred to a specialist balance centre where she was told that her symptoms were due to PTSD resulting from a turbulent flight. *Sigh*. With this kind of misattribution being all too familiar to me, it’s no wonder that the prevalence of MdDS – including the subtypes (where symptoms occur but are not triggered by a motion event) – and familial MdDS is still unknown. Meanwhile situational anxiety and depression are common in rare conditions, partly resulting from diagnostic delay, misdiagnoses and mistreatment (in all senses of the word) as illustrated in a report from Rare Disease UK following their survey into mental health issues for people with rare conditions. Read more here. But what’s doubly distressing is that delayed, missed and misdiagnoses hinder those intrepid researchers who study rare conditions. So if I could change the Hippocratic Oath I’d add – on behalf of rare conditions patients/researchers everywhere – “It’s OK to say ‘I don’t know – but I want to learn’”. Meanwhile our awesome MdDS researchers have done wonders. When I joined the fora few of us dared to hope that treatments would be available in our lifetimes, yet there are now two trialled treatment protocols. The UK patient group has focused (pun intended) on the opto-kinetic protocol devised by Dr Dai and his colleagues in New York, which you can read about here. This treatment is now available in the UK but it’s not provided by the NHS and few of us can afford it. Navigating the UK reimbursement policies is also notoriously difficult and seems harder than the average diagnostic odyssey. After all the hard work our researchers have done, that feels wrong. Also fellow researcher Dr Bernard Cohen and colleagues won the 2018 Frontiers Spotlight Award Research Topic, showcasing effective new treatments for common health disorders. You can read about it here. For those with an interest in rare conditions generally, Findacure host regular events. There are also other regular events regarding rare conditions and all health care professionals are welcome. Article courtesy of a donor to MdDS Foundation. att. 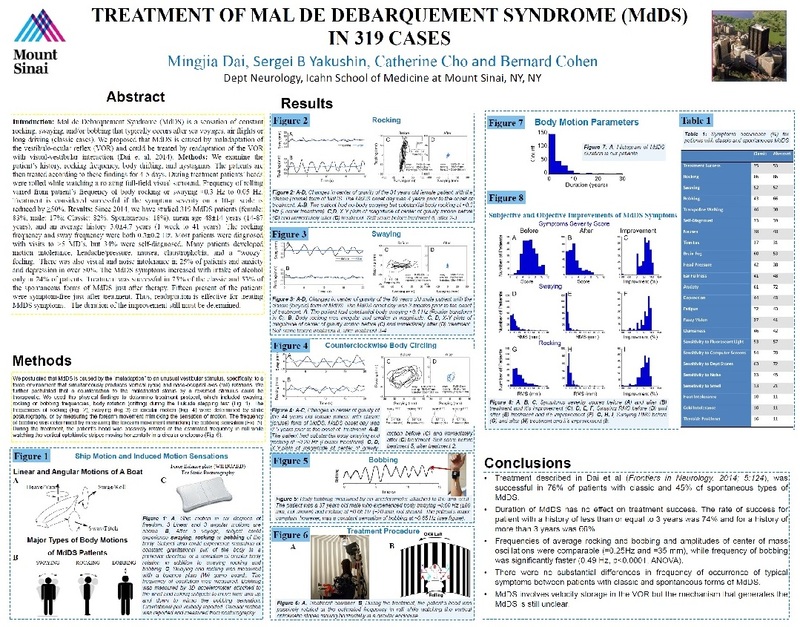 Poster presentation – click on image to download PDF of poster. Also available – a new video from House4Balance, shown at ‘RAREfest18’ and generated some interesting questions from the audience, and can be found here.